أيضا، يتضمن الجلود في الوان مختلفة مناسبة لميلك. Want better sound? - Please try out "Effect -> Open Air". Want to equalize volume among songs? 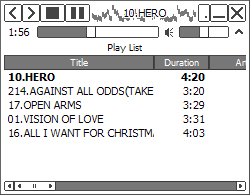 - Use "Individual Volume" menu by right-clicking each song.